Washington March Snow: Rare Event Becoming Rarer? The climatological average for March snowfall in Washington is just 1.3", so significant snowfalls in the first month of meteorological spring are rare. With the bust of the current "Snowquester", it's likely that 2013 will add to a string of nearly snowless Marches extending back to 2009, when a total of 5.5" was recorded. 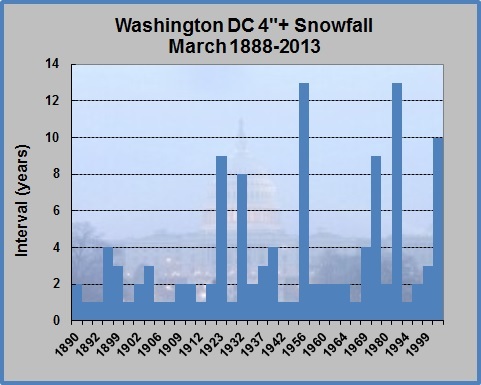 In the early days of official snowfall records, which began in Washington in 1888, March snow was relatively common. In fact, the first 6 years in the climate record had measurable March snow; 3 of those were over 10". The chart shows on the horizontal axis all of the years with 4" or more of total snowfall in March. The vertical axis is the number of years since the previous occurrence of 4"+. For example, if 4" occurred in consecutive years, the interval would be shown as 1. For the first several decades, the interval between significant March snows never exceeded 4 years, but in 1923 it reached 9. The interval reached double digits for the first time in 1956, when it was 13. It was 13 again in 1993, and 10 in 2009, which ended a March snow dry spell that began after 1999. Unless this month has a miraculous snowfall recovery, the current March snow drought will be 4 years and counting.